With tabletop growing year by year, it can be hard to keep up with where to direct your attention. Owen Duffy's freshly-launched Kickstarter campaign for The Board Game Book aims to shift things into a bit more focus. This is something to keep your eyes on if you want a great coffee table piece, a gift for a board game connoisseur, or just want to find a good jumping off point for newbies. Featuring an introduction from Ian Livingstone (of Games Workshop fame), the book is being written by industry veterans with all the love and care you could expect from people who've been following this hobby for many years! We spoke to Owen Duffy about the project to find out more about what would be included in The Board Game Book, and the team's inspiration for creating it. Who is the team behind The Board Game Book, and how did you come together to collaborate on this project? We’re a team of games authors and journalists, and our work has appeared in places including The Guardian, Tabletop Gaming Magazine, Ars Technica, Shut Up & Sit Down, VICE, PC Gamer, IGN and Geek & Sundry. We all have a shared geeky passion for tabletop games, and for the past few years we’ve been reviewing games, interviewing creators and generally spreading the hobby to anyone who will listen! I put the team for the book together based on folks whose work I admire. It’s kind of like my own personal Justice League of games journalism. There’s Matt Thrower, who’s an incredibly experienced writer who packs a tonne of personality into his work. There’s Teri Litorco, who’s a real expert on the miniature gaming side of the hobby and just has tremendous enthusiasm that comes through in everything she does. And there’s Richard Jansen-Parkes, who writes the most considered, insightful RPG coverage I’ve seen anywhere. It’s a real thrill to be working with these folks! You’ve extensively covered tabletop gaming for a long time - what is it about the hobby that drives your interest? I’ve been into gaming for as long as I can remember. I started out at a young age playing Warhammer, then graduated to RPGs like Dungeons & Dragons and Vampire: The Masquerade when I was a bit older. And then finally I got into board games in a major way, and I was just blown away by the variety and the creativity in the industry. I think the common thread to all the games I’ve enjoyed, though, is that they’re so inherently sociable. They’re as much about the experience you share with people around the table as the actual mechanisms and components of the games themselves, whether that’s light, silly fun or a day-long strategic contest. Some of the most important friendships in my life have been born out of gaming. I even played RPGs with my wife before we even started dating! I guess a big part of what drives me to write about games is the desire to share the hobby with other people. I’ve had so much fun and so many great experiences through gaming, and helping other people to discover the hobby and the community feels incredibly rewarding. What inspired you and the team to create this book? There were a couple of factors. One was the success of Tabletop Gaming Magazine in the UK, which I’m a contributor to. The team there has done fantastic work, and they’ve really proved that print is alive and thriving as a medium in the hobby. But the real trigger for me was walking into the big Waterstones bookshop in Glasgow and realising that they had a bigger board game selection than some game stores I’ve visited. I saw people encountering these games for the first time, and I thought it would be really cool to have a product on the shelves next to them that could guide people into the hobby, deepen their interest and their appreciation of games and highlight some of the best stuff that’s happening right now in the industry. With so many games being released every year, I think the sheer variety on offer can be a bit intimidating to newcomers, and I think there’s a place in the market for a book that helps people find things to love based on their own tastes. That’s not to say that we’ll just be covering entry-level games, though! 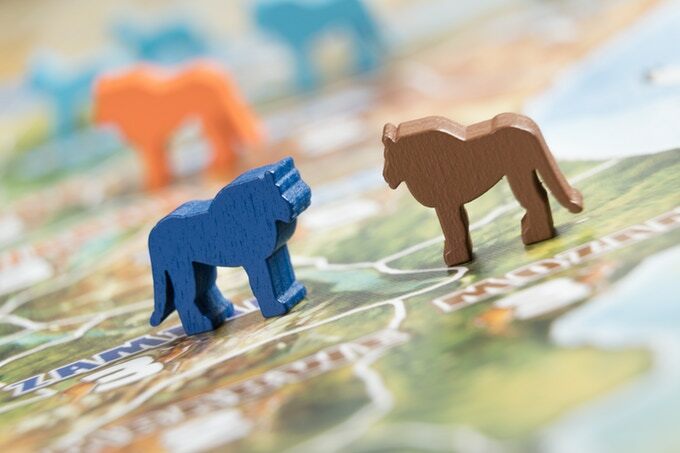 We’ll be looking at everything from five-minute family games to complex strategy. What aspects of tabletop gaming will you cover in the book? We really want to represent the diverse creativity in the hobby right now. There are games to appeal to everyone, and that’s something we’re really keen to reflect in the book. We’ll have chapters on family games, casual and party games, light, medium and complex strategy. We’ll also be covering miniature wargames and RPGs, and there’ll be a dedicated chapter looking at current and classic gateway games for people just getting into the hobby. What I personally find most interesting, though, is that we’re talking to the designers behind all of the games we feature. Getting the inside story on the creative processes behind these games is absolutely fascinating. I’d compare it to an interview with your favourite band or author, or the director’s commentary on your favourite movie. I really think that finding out about the influences and ideas behind a game can deepen your appreciation of it, and I’m really excited about bringing that to our readers. The games included in The Board Game Book are handpicked by you and the rest of the team. How are you deciding which games to cover? There’s so much great stuff coming out at the moment, so the problem isn’t finding enough games for the book, it’s more about narrowing down an incredibly wide field. There’s a constant discussion between the team about what we’ve played, what we’ve enjoyed and why it makes for an interesting entry in the book. Ultimately, there’s no set of objective criteria, it’s about the experiences games are trying to create and how well they work when we get them to the table. One thing we are trying to do is balance the book in terms of themes, audiences and levels of complexity, though. So we’re making sure to include games that will appeal to lots of different audiences, whether someone’s interested in games to play with their kids, or light-hearted stuff for casual groups, or longer and more thoughtful games for people who really like to get into chewy, brain-burning gameplay. And another consideration is that I really don’t think enough is being done to highlight and celebrate the work of women and nonbinary creators in the industry. We’re not going to include any games in the book just because of the creators’ gender, but we’re making sure to play and consider games from a diverse group of creators, and to give them equal consideration in what’s still a male-dominated industry. The photography examples for the book are gorgeous; will you be collaborating with a particular photographer for the imagery? Thanks so much for saying so! I’ve actually done all of the photography so far myself. I’ve been into amateur photography for a few years now, and in preparation for the book I took a college course to develop my skills. I’ve set up a home studio, and it’s been the excuse I needed to upgrade my camera. I’m really keen that the photos in the book show off the visual character of all of the featured games. The industry is getting so sophisticated in terms of artwork and the physical design of components, and I think that physical, visual, tangible appeal is one of the hobby’s greatest draws. We really want to do justice to that in the book, so as well as straightforward ‘product’ shots, we’re trying to capture the feeling behind games with some close-up macro photography and shots that highlight particularly lovely elements from specific games. Who is The Board Game Book for? We’re trying to ensure that it appeals to a broad audience. If someone’s new to the hobby, we want it to be a useful guide to what’s hot in the industry right now. If someone’s a bit more experienced, we want to give some new insights and interesting stories behind the games they love. And I think the unifying factor is that we’re appealing to the love of beautiful physical objects that I think we all share in the gaming community. Obviously there are plenty of places to learn about games online, but I think this hardback book is going to be something special. I have a phone and a tablet and a Kindle, but I still really prefer the experience of reading a printed book, and we’re working with a really great printer who produces books for some of the world’s biggest publishers. It’s going to be as nice as anything else you’d expect to find on book store shelves. What’s been one of the stand-out moments to have come from your interviews for the book so far? It’s great to get the behind-the-scenes story on games I’ve really enjoyed. 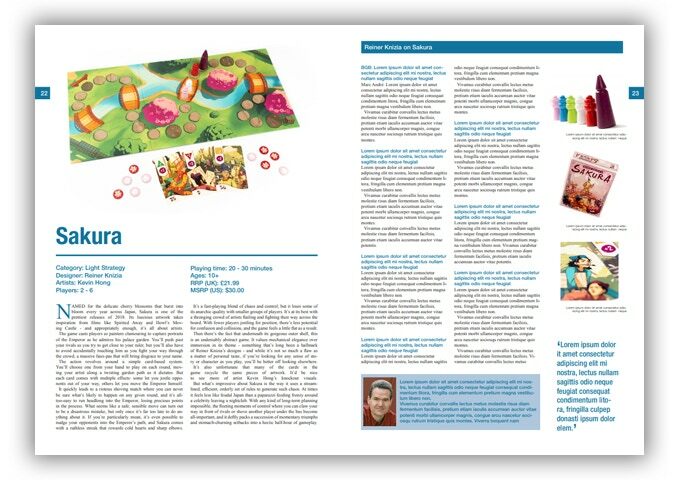 One particular highlight has been talking to Reiner Knizia about his game Sakura. Reiner’s obviously a huge name in the industry, and he also turned out to be a lovely guy with just massive enthusiasm for games. Finding out about his creative methods and how he distils different settings and themes into very clear, elegant game mechanisms was really interesting. And then it was also great doing a longer interview with Jacob Jaskov, the creator of Fog of Love. It’s such a departure from a lot of the standard gaming themes like orcs and zombies and aliens, and I love seeing games tackling new ground like this. He did a tonne of research into the structure of romantic comedies and the psychology of relationships for the game, and I also thought the personal story of how he wanted to develop a game with a target audience of his wife was really touching. I’ve been really glad to see the game doing so well. Both of those interviews are in the preview PDF on our campaign page, so if people want to read them they can download it and take a look. Have you gained any insights into the current trends or the future of tabletop gaming from researching The Board Game Book? One thing that’s really coming through is the development of storytelling through game mechanisms. Whether that’s something like a legacy game, where you have these campaigns full of twists and turns and new developments, or the likes of Legacy of Dragonholt which has a branching, Choose Your Own Adventure-style plot full of really well-developed characters and locations, it’s something that I think will appeal to a lot of new players. In any other medium - movies, novels, TV, comics - story is the hook that grabs peoples’ attention and gets them emotionally invested. I think games can do that on an incredibly personal, interactive level. What games have you seen or played recently that got your attention, and why? I recently played Imaginarium, which is an engine-building game about workers in a dream factory. Mechanically it’s an interesting brain-teaser. You’re combining all sorts of weird and wonderful machines to generate resources, and it feels like being a kind of Willy Wonka crazy inventor. But what really blew me away was the presentation. It has this steampunk art style, but it’s very different from a lot of the derivative stuff you sometimes see in that kind of work. It’s very surreal and dreamlike, mixing manipulated photographs and more traditional illustration. It actually reminds me a little of Terry Gilliam’s animations in Monty Python. I also had a sneak peek at the upcoming game Holding On: The Troubled Life of Billy Kerr. It’s a cooperative game about hospital workers caring for a dying man, and you have to try to provide medical care while also helping him to untangle the story of his life and find peace with his memories. Again, it’s doing incredibly interesting things with plot and characterisation, and I’m really looking forward to playing through the whole campaign. The Board Game Book is live on Kickstarter now, and will be campaigning until the 4th of July!